The Digital Research Library of Illinois History Journal™: The History of the Main Chicago Public Library. 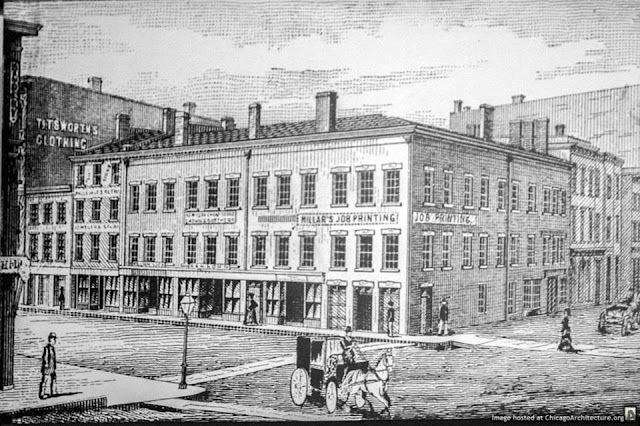 The first library in Chicago dates back to 1834 when the Chicago Lyceum maintained a circulating library of 300 volumes for its members. The Lyceum’s popularity faded and in 1841. 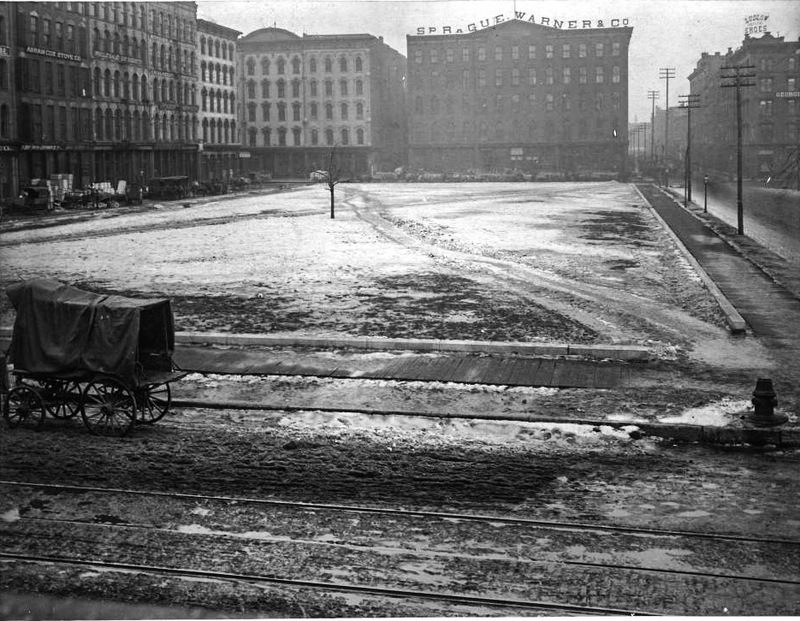 The Chicago Lyceum, a debating society, met at this "Saloon Building" which stood on the southeast corner of Clark and Lake Streets. NOTE: The word “saloon” at that time did not imply so much a tavern as a spacious meeting hall; it derived from the French word “salon.” It offered the largest hall west of Buffalo, NY, for concerts, debates, dramatic performances, political ceremony and private club offices. Chicago received its city charter under its roof in 1837 and it served as city hall and Municipal Court until 1842. 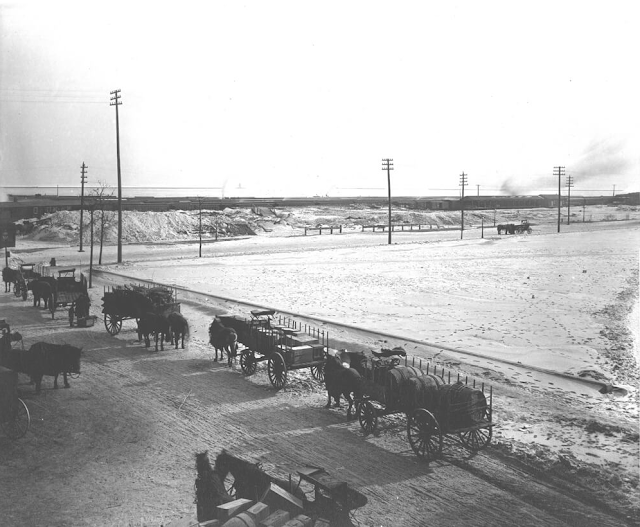 Some of the Chicago Lyceum members formed a new cultural center, the Young Men’s Association, created as a place for leisure and amusement away from the vices of gambling halls and saloons. The Association had a public reading room with a collection of 30,000 books, all of which were destroyed in the Great Chicago Fire of 1871. In the aftermath of the Fire, Londoner A.H. Burgess, with the aid of Thomas Hughes, drew up what would be called the "English Book Donation," which proposed that England should provide a free library to the burnt-out city. After circulating requests for donations throughout English society, the project donated 8,000 books. Many volumes were autographed by their donors, including Queen Victoria, Benjamin Disraeli, Alfred Lord Tennyson, Robert Browning, Charles Darwin, John Stuart Mill, John Ruskin, and Matthew Arnold. With these books as the base of the collection, Chicago’s leaders established the Chicago Public Library in April 1872. The Library Board arranged for the collection to be housed in an old water tank. For many years following, the library occupied various temporary spaces while Board members looked for a permanent site. By 1874, the collection was available for circulation without charge to all Chicagoans, and two years later it had 120,000 volumes! 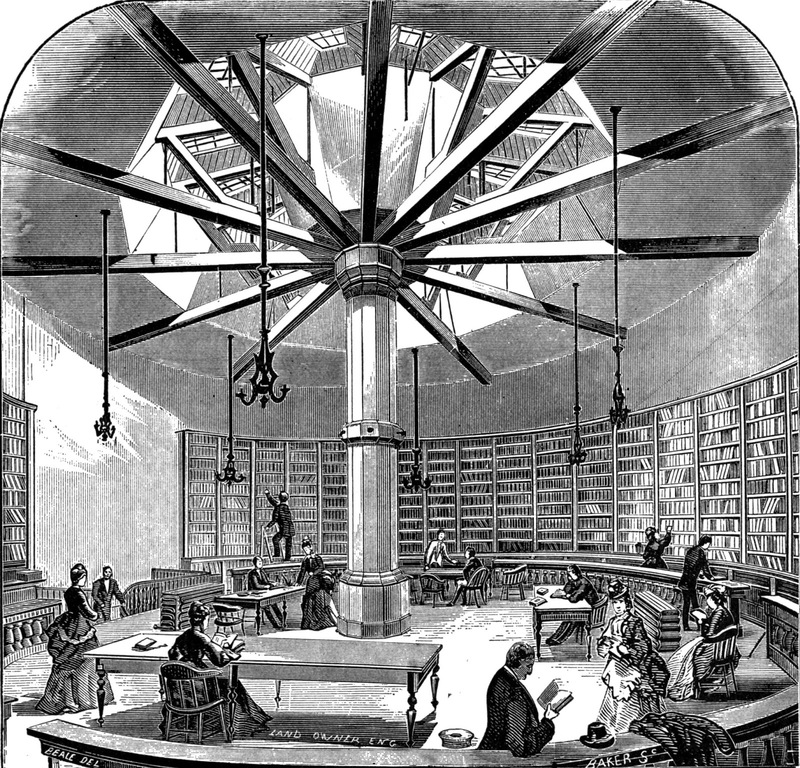 By 1891, Chicago boasted the largest library system in the country. William Frederick Poole, the city’s distinguished librarian and a nationally recognized scholar, is credited for much of the library’s success in that era. Burgess wrote on December 7, 1871 in the London Daily News that "I propose that England should present a Free Library to Chicago, to remain there as a mark of sympathy now, and a keepsake and a token of true brotherly kindness forever..."
In Chicago, town leaders petitioned Mayor Joseph Medill to hold a meeting and establish the library. The meeting led to the Illinois Library Act of 1872, which allowed Illinois cities to establish tax-supported libraries. In April 1872, the Chicago City Council passed an ordinance establishing the Chicago Public Library. 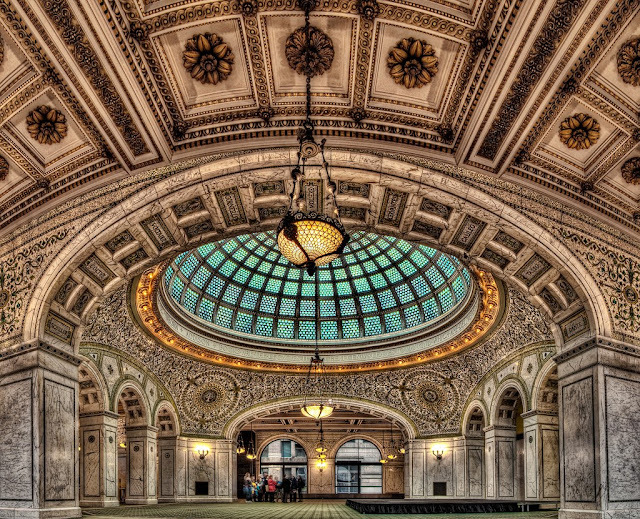 In the rebuilding section of the city, on January 1, 1873, the Chicago Central Library, as it was originally named, officially opened its doors in an abandoned iron water tank (fireproof) at LaSalle and Adams Streets. The collection included 3,157 volumes. The water tank was 58 feet in diameter, 21 feet high and with a 30-foot foundation. A two story office building was soon built around it to hold city offices, and a third floor reading room was built for the library. Controversy and legal squabbles troubled the efforts to build a permanent home for the Chicago Public Library. The search became a high priority in the 1890s when the library's priorities shifted from service to enlightenment. This corresponded with Chicago's larger cultural renaissance, which included the creation of the Newberry and Crerar research libraries. The three libraries agreed to divide the areas of study among them — the humanities to the Newberry library, the sciences to the Crerar library, and popular collections to the public library. Frederick Hild, Chief Librarian at the time, campaigned to move the library from its quarters in City Hall to Dearborn Park, a lot fronting Michigan Avenue. On Monday, October 11, 1897, the Chicago Central Library, on Michigan Avenue between Washington and Randolph streets, opened its doors. The building, on the grounds of Dearborn Park (named for the Fort Dearborn Military Reservation that formally encompassed the area), cost about $2 million (about $58,500,000 today). 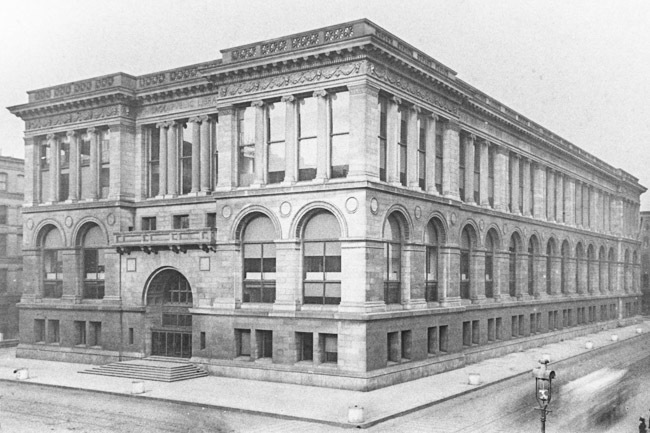 The original Central Library, built on the Dearborn Park site on Michigan Avenue between Washington and Randolph streets. circa 1898. The building was designed by A.H. Coolidge who won a building design competition, an associate of the firm Shepley, Rutan & Coolidge of Chicago. It took 25 draftsmen a year to complete the 1,200 blue print drawings. Heedful of the lessons of the 1871 Great Chicago Fire, they designed the building to be practically incombustible. The Chicago Central Library building served two purposes as the first permanent home for the Library (the building's south/Washington Street side) and the headquarters for the Grand Army of the Republic, the Civil War Union Army veterans' organization (the building's north/Randolph Street side). 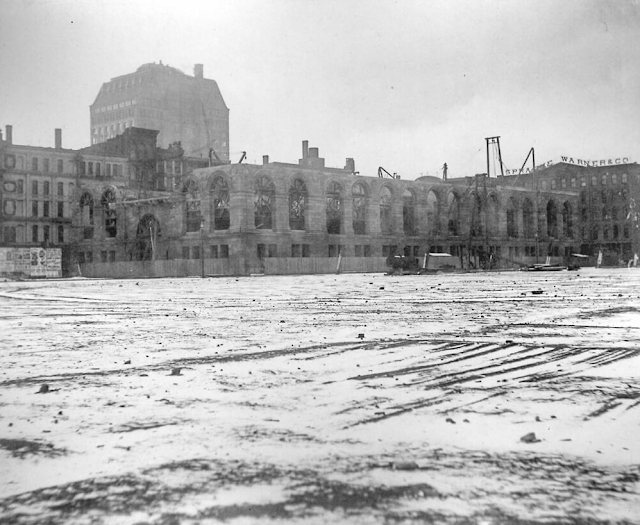 By the mid-1920s the library began to outgrow its space. As early as the 1930s the inadequate space at the library became a topic of public discussion. Between the 1930s and 1970s the scope of the library’s offerings continued to expand; it was clearly overcrowded. Even as early as the 1920s, the Chicago Public Library had already established itself as a landmark in the hearts of Chicagoans. A 1967 architectural survey conducted by Chicago architects Holabird and Root confirmed that although the building was still structurally sound, the mechanical, electrical and communication systems were obsolete. Some changes were necessary. A design competition for renovation of the Chicago Public Library was held in 1970. Two architectural firms from Madison, Wisconsin shared the prize for the winning design, estimating that the project would cost a prohibitive $28 million. Soon the library became the center of a spirited public debate. City officials were challenged to provide Chicagoans with a cost-effective, updated public library and some suggested that the building be demolished. Preservationists wanted to save it, both for its magnificent beauty and as a monument to the past. Approximately half of the library’s books and periodicals had been moved to another location by 1974. Consequently, the library’s collection was then housed in two facilities. That same year, the firm of Holabird and Root was selected as the architects for a much-needed building renovation. The architects viewed the structure as an historic treasure and their sensitive design kept the exterior and most of its decorative features intact and unchanged. The renovation began in 1974 and was completed in 1977 when the Chicago Public Library building was renamed the Chicago Cultural Center. 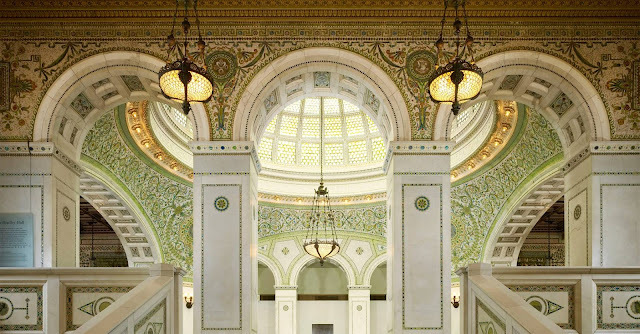 The center of this building, now known as Preston Bradley Hall (Preston Bradley was on the Chicago Public Library Board for over 25 years), contains a dome and hanging lamps designed by the Tiffany Glass Company of New York. The Washington Street entrance, grand staircase and dome area contain inscriptions of 16th century printers’ marks, authors’ names and quotations that praise learning and literature in mosaics of colored stone, mother of pearl and favrile glass. The Chicago Public Library is home to the largest Tiffany stained glass dome in the world. In 1947, the Chicago Public Library took over the entire building. 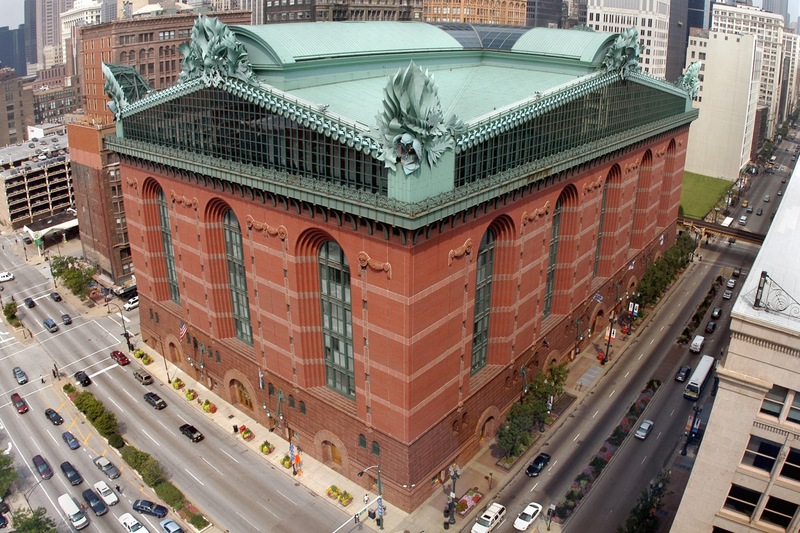 Then in 1991 the Chicago Public Library vacated the building when it opened its new State Street location named the Harold Washington Library Center after the first African–American to be elected as mayor of Chicago. Washington served from 1983 until he died in office in 1987. In 1991, the new Harold Washington Library Center was dedicated. The Harold Lee Washington Library, 400 South State Street, Chicago, Illinois. 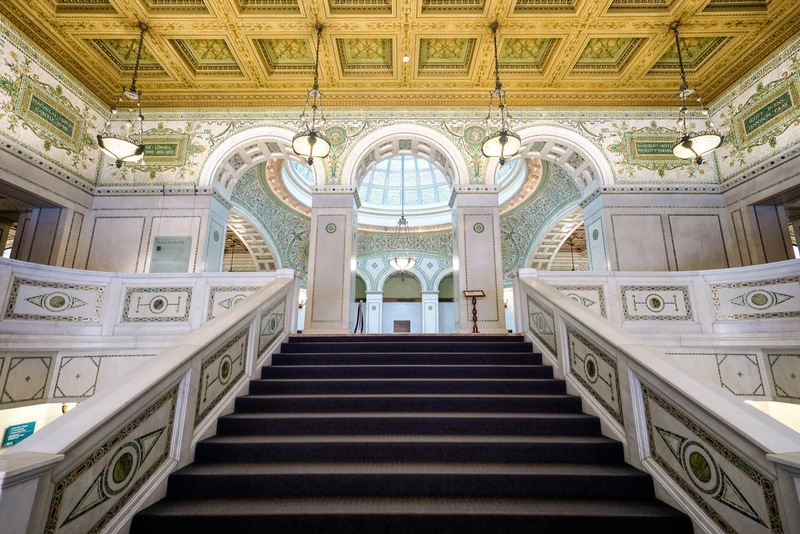 The same year the original library building was rededicated as the Chicago Cultural Center and became the nation's first free municipal cultural center. The Chicago Cultural Center is listed as a Chicago Landmark and on the National Register of Historic Places. Compiled and Edited by Neil Gale, Ph.D.
You really have our history together....I love it Neil! Thank you for another bit of history of this beautiful city of which I was unaware.